Step 1. Make your monthly membership subscription through the PayPal button opposite. Our custom Celtic Pagan ID Card is valid for 3 years and is available to all human beings in every country in the world. Our id cards have a unique membership number and members can identify and declare as a freeman / woman / human being. This is not a compulsory identity card, it is an optional way to declare within the established system that you must have your rights recognised and that your Celtic Pagan beliefs must be honoured and respected too. 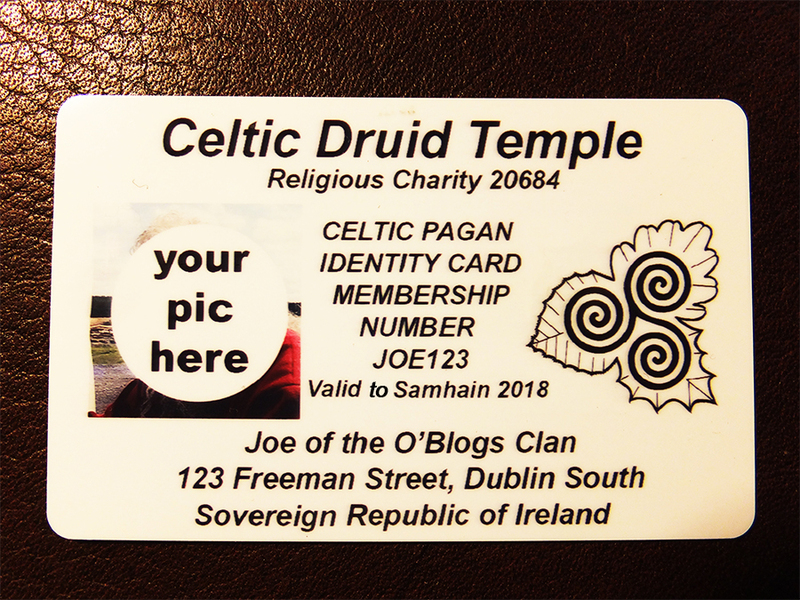 With this card you can prove that you have made a choice by using and displaying your Celtic Pagan Identity Card. Each member is a sovereign, a free person that will not be ruled or enslaved, being self-reliant, self-sufficient, independent person of any race that is self-directed, self-disciplined and self-governed. 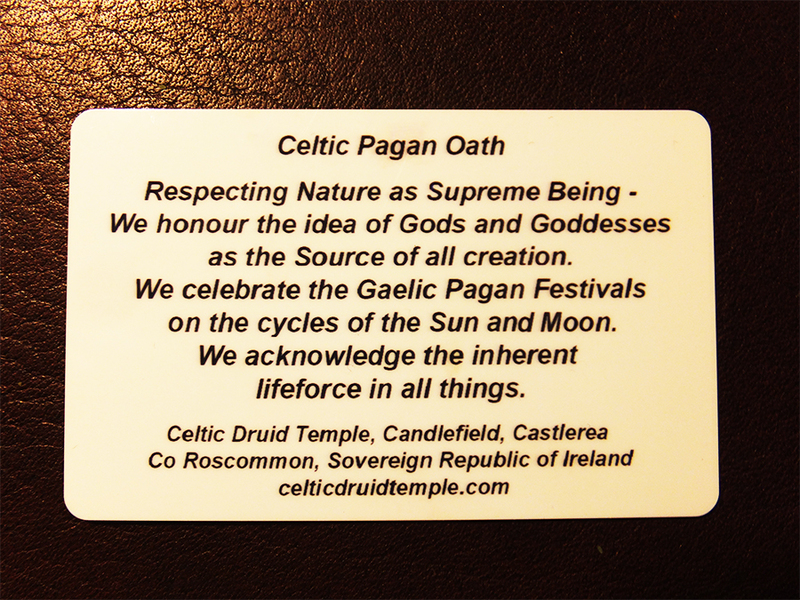 A freeman / woman / human being believes that our rights come not from man-made governments but from Nature as Supreme Being and that all are responsible and accountable for our own actions.We offer this Celtic Pagan ID Card as a tool for you to express yourself when interacting with the established system to help in gaining recognition and respect for your choice and for our indigenous traditions. Sovereignty does not require ownership of property - instead it declares the full right and power of a person to govern his or her self without any interference from outside sources or bodies. Once you've made your membership subscription, please email us a recent colour picture of your head and shoulders, you can smile and choose any background but be sure that you can be easily recognised. We will resize your picture. Ideal picture size is 1 inch x 1 inch x 300dpi. No avatars or animals, a real picture of you is needed for the photo id card. These cards are issued at any time during the year and as the Celtic Year ends and begins on the Dark Moon of Samhain, the three year validity term ends at Samhain (October / November). There are many interactions with wider society and state services in particular where this Celtic Pagan ID card may be useful for you. For example declaring your religion or spiritual beliefs in a formal way may affect how you are treated in hospital, the Health Service Executive HSE in Ireland actually has a pamphlet for its staff detailing how to work with Druid / Pagan patients. Employment laws also declare that your employer cannot discriminate against you on the basis of religion, your employer must treat your requests for time off for religious holidays and pilgrimage with respect, and may not instruct you to take holidays at certain times that may prevent you from taking the time when you need it for your religious observances, however - this must be respectfully worked out between you and your employer. This is the Celtic Pagan Oath that shows respect to Nature from where everything comes and to our ancestral Gods and Goddesses, to ritual ceremony marking true time and to the sanctity of all life. I said 'Con' and realized that she was thinking that Ard was a strange first name as in Irish it means 'high'.... A few seconds later she looked me in the eye, smiled and gave my Id card back to me. Then she advised on where to park etc and we drove off. We thought this result was positive and fun and recalled a story of a member who showed his Celtic Pagan Id card to an official in the Social Welfare office. Blankness was the first reaction, then this was followed by an awareness that 'religious discrimination' has lots of paper work etc and after a check of the picture against the face of the bearer, our Id card was accepted as valid proof of identity. As we get more feedback on system reactions to our Celtic Pagan Id Card = we will share them here.